The southern African bloc SADC has hailed Felix Tshisekedi as the new president of Democratic Republic of Congo despite claims by his opponents of electoral fraud and queries from the African Union and European Union over the validity of the result. The Constitutional Court rejected a legal challenge from beaten opponent Martin Fayulu when it announced the final results early Sunday. It declared 55-year-old Tshisekedi the winner to succeed Joseph Kabila as president. The African Union cancelled a delegation to Kinshasa, planned for Monday, after the final results were announced. The European Union had also called for the results to be delayed. It joined with the AU in inviting all players to work constructively with the AU delegation to find a solution which respects the people's vote. However, there was no such hesitancy from the 16-nation Southern African Development Community. It congratulated Tshisekedi after he was declared president-elect and urged a peaceful handover of power. "SADC reiterates the need to respect the sovereignty and territorial integrity of the DRC," its chairman Hage Geingob, president of Namibia, said in a statement. South Africa also urged all parties to accept Tshisekedi's win. Hundreds of Tshisekedi supporters celebrated the Constitutional Court's announcement by blowing whistles and horns near his party headquarters in the capital Kinshasa. Fayulu, who has described the outcome of the vote as an electoral coup, has called for peaceful protests. 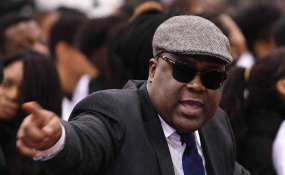 He has alleged that Tshisekedi promised to protect long-time leader Kabila's political and financial interests in return for helping to ensure his victory. "I ask the entire international community not to recognise a power that has neither legitimacy nor legal standing to represent the Congolese people," he said. Jason Stearns, director of the New York based Congo Research Group told RFI: "The Constitutional Court hasn't done anything surprising. In the past its decisions were sympathetic towards the government ... seven of its nine judges are quite close to the ruling party so that doesn't really leave much doubt about their decision." Tshisekedi has urged unity. "This is not a victory for one side or the other," he said in a video message. "The Congo we are going to build will not be a Congo of division, hate and tribalism - it will be a Congo that is reconciled, a strong Congo, looking towards development, peace and security for all."